At our (Indonesian Teachers Hub Group) last meeting, Annie mentioned that she is focusing on the skill of circling at the moment. Circling is an integral skill in TCI and I suddenly realized that it had not been a focus lately in my recent lessons. I then decided that I too needed to hone my circling skills and so determined to incorporate more circling into my lesson plans. Circling is the instructional practice of asking a series of prescribed questions in the target language about a statement in the target language. Circling is used to provide students with contextualized repetitions of target structures. Circling is a powerful TCI strategy which ensures students are engaged and acquire language totally without realising! 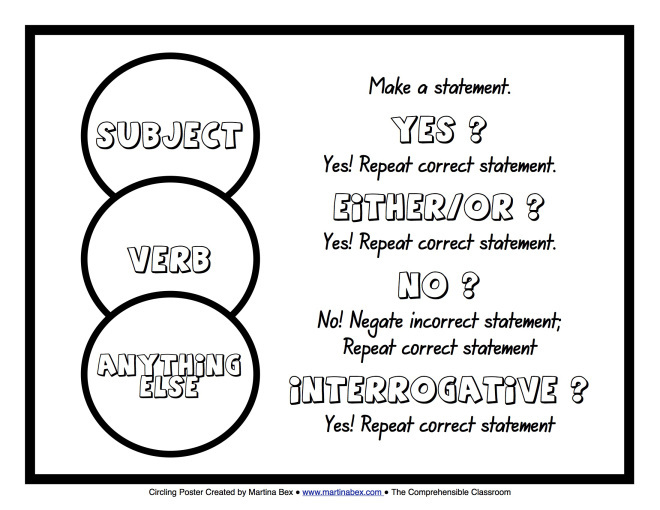 Using this format, I wrote circling questions into my lesson plans focusing on each of the above steps to prompt my memory and help develop my circling proficiency. I tend to find that when I am in front of a class, my mind goes blank whenever improvisation is needed!! 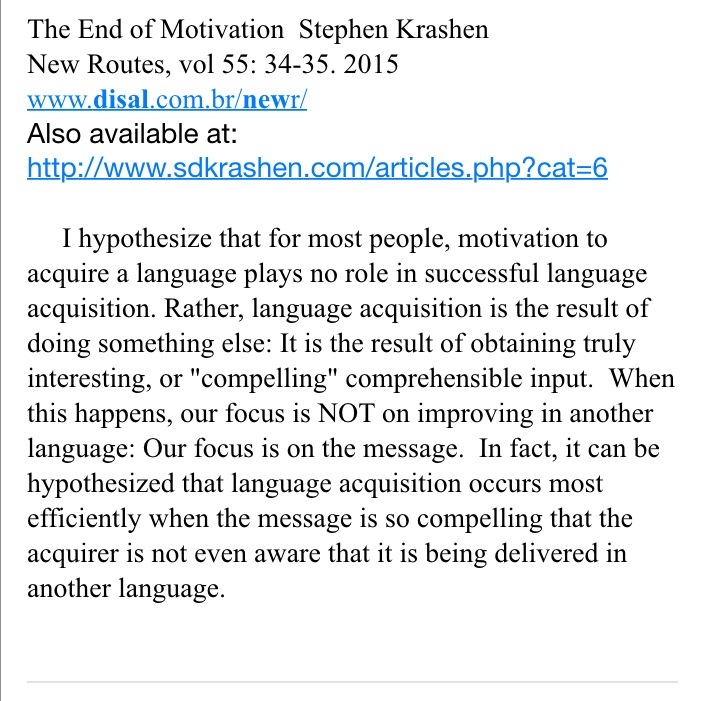 Hopefully this is something that will reduce as I gain confidence and experience with TCI methodology. b) Indie pakai sepatu? (ya) Ya, Indie pakai sepatu. c) Indie pakai sepatu atau Indie pakai jaket? (either/or) Indie pakai sepatu. d) Indie pakai topi? (ya/tidak) Bukan. Indie pakai sepatu. e) Indie minum/makan sepatu? (3 for 1) Bukan! Indie pakai sepatu, Indie tidak minum sepatu! 2. Flick berkata? (ya) Ya, Flick berkata. 3. Flick berkata kepada Ella. (ya/tidak) Ya. Flick berkata kepada Ella. 4. Flick berkata kepada Ella atau Flick berkata kepada Thomas? (either/or) Flick berkata kepada Ella. This amount of detail was so helpful. I could refer to my notes at any point to ensure I covered all aspects when/if necessary. Writing it too helped clarify in my mind so that my response should always be either the initial sentence or include the initial sentence! I felt that at last I was getting a handle on circling! Then with brilliant timing, several TCI teachers wrote blogs posts specifically about circling. 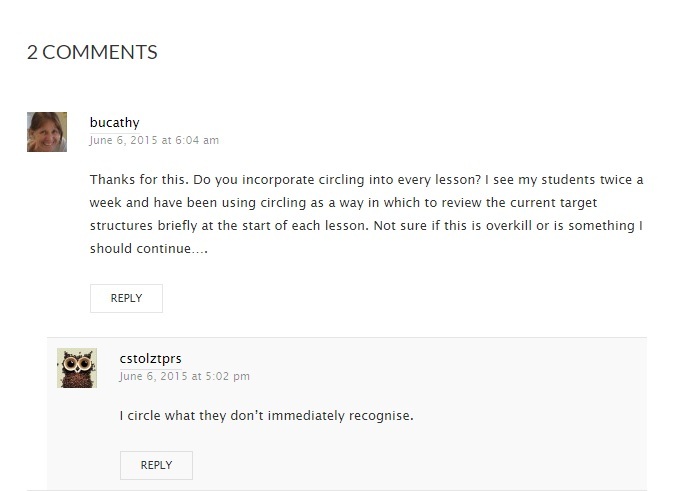 Keith Toda posted on his blog, Todally Comprehensible Latin, Circling – The Art of Questioning and Chris Stoltz posted on TPRS Q & A his post ‘What is Circling and How Do I Do it?’ Both are great and I highly recommend you read them to grasp the finer details of circling. When I first read his reply, I was taken aback by its brevity and once I had recovered, I started to think about his point. If I was to circle only what students didn’t understand, then I was going about “circling” the wrong way. The next thing that happened was again by coincidence. I had emailed Ben Slavic about micro stories suitable for primary (elementary) students. He replied with an attachment of his draft chapter called Super Mini Stories. In this chapter, Ben focuses in great detail on the skills needed to tell a story. Reading this with my trusty highlighter was illuminating. Chris’ statement ‘Circle what the students don’t understand” suddenly gelled. Circling has to be done in context and more importantly, stories must have input from students. This is what makes TCI compelling. Ibu kasih Bobby satu jaket. Bobby pakai jaket di kaki. Bapak kasih Bobby satu baju. Bobby pakai baju di kepala. Kakek kasih Bobby dua sepatu. Bobby pakai sepatu di tangan. Next I asked the class, “Caden perempuan atau Caden laki laki?” The class invariably answered “Caden perempuan.” To which I checked in with my actor, “Caden laki laki atau Liam perempuan?” If he answered, “Caden perempuan”, I would then confirm, “Caden perempuan!” Next I asked students, “Siapa nama Caden? ‘Caden’ nama laki laki!” Sometime, classes came up with a hilarious female version of the name (Luke became Lukette, Kody became Kodella) and sometimes they would come up with a name that has been bandied around lately. For some reason Jeff and Bob are hilarious names!! Go figure! Ada perempuan. Nama perempuan Delilah. (students decided that Caden would become his twin sister!) Delilah dingin. Delilah berkata kepada???? Delilah berkata kepada siapa? (laser pointer to ‘siapa’ poster up above the whiteboard) If students suggested the name of a fellow student, I would answer, “Bukan nama murid di kelas ini.” Because I wanted them to come up with some quirky suggestions. I would settle on the suggestion that got the most catcalls!! Justin Bieber and Tony Abbott were up there!! I next asked, “Siapa mau….. Justin Bieber?” That actor was also asked to ‘berdiri’. I would then recommence my story from the start to throw in some sneaky repetitions. Justin Bieber kasi Delilah satu jilbab. Delilah pakai jilbab di kepala. Delilah masih dingin. We continued till the end of the story this way. It was hilarious and totally compelling!! I love that TCI provides me with ways in which I can laugh with my students while teaching!! 1. Circle what they don’t know!! 2. Don’t forget to ask quantity of clothing! E.g. dua sepatu!! 3. Go SLOW!! Don’t rush!! Slow and steady is how students comprehend and acquire the target structures. Make the most of each repeititon. 4. Try to make circling sound like natural speech using familiar vocabulary while incorporating all the facets of circling. E.g. negative, either/or, 3 for 1, asking for extra detail.